Custom Foam Packaging Chicago - Foam Packaging Fabrication | Foamcraft USA, LLC. Foamcraft USA fabricates packaging products for customers across a wide range of industries. Packaging protects products for distribution, storage, sale, and use. Packaging also refers to the process of design, evaluation, and production of packages. 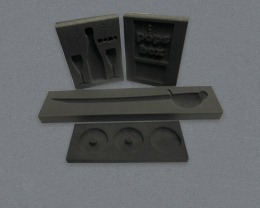 We offer a variety of capabilities to create custom cut foam for your packaging application. Non-fragile items only require an exterior container like a corrugated carton, case, box or crate. Items that are more fragile, however, require foam. This can be as simple as void fill, interlining or cushioning a part within a container, or it can be as sophisticated as designing a custom foam packaging system for a very fragile instrument utilizing computer design incorporating drop curve analysis, consisting of drop-height, item weight, fragility (in the form Gs) and static load. Some items simply require functionality while others require a dressy or unique appearance. Foamcraft offers foam in a variety of materials, including polyurethane, polyethylene, and polystyrene. Whether you are at one end of the spectrum or the other, or anywhere in between, talk to us about how to best package your product. We are the packaging leaders with our vast array of machinery, materials, design and engineering expertise. Plus, we offer one thing that is rare in this industry: we know how to listen. We will really hear you when you tell us what you require in your foam packaging fabrication and help create what you desire, or something beyond what you thought was possible. Get a quote today.